This stunning and aptly named Karawan teapot is available at Mariage Freres in Paris. 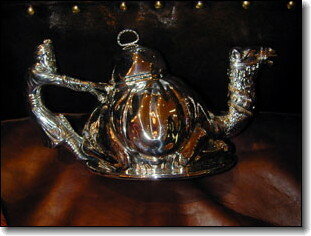 It's a remake of a nineteenth century orientalist teapot and comes in either sterling silver or silver plated metal. It has a porcelain interior. Although quite expensive (over 1000 € for the plate version), I find it a fabulous piece. It has exotic, traditional, luxurious, whimsical written all over it and combines in a single piece a lot of the values I associate with tea. Although I don't really use it (as I'm afraid to break it), I do have it exposed in my kitchen and just love looking at it whilst I make my morning cup. It's also a great example of why I like to call Mariage the Hermes of tea. They really do understand how transform tea into luxury (and gold ...). 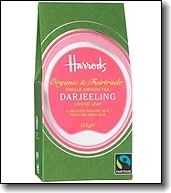 This is a simply brilliant (and cheap...) organic second flush Darjeeling that comes from the Fairtrade estates. It makes a quite delicious brew that is suitable for any hour of the day (save night perhaps...). The idea of organic for tea makes a lot of sense. Indeed, if you consider that tea is an infusion of dried leaves, then the idea of having leaves that are not chemically treated and hence don't leave any chemicals in your boiled water makes it almost seem obligatory. I imagine that as time goes on, at least at the premium level, all teas will become organic even if it means reduced yields. But then again, maybe this is just hopeful thinking. Anyhow, if you are in London, it's definitely worth dropping by Harrods to get this tea. It's a great everyday day tea at a great price (5.95 £ for 125g). You can also buy it online here. For the true tea connoisseur, adding sugar to tea is a heresy as it alters the liquor enormously. The habit of adding sugar to tea didn't come from China. It appeared in the late 17th century in Britain and is thought to have originated as a way to combat the astringency of some of the green teas that were being imported. By the late 18th century, British tea drinkers were consuming 10 times more sugar then their european counterparts. Everywhere the British went to build their empire, the habit traveled with them i.e. 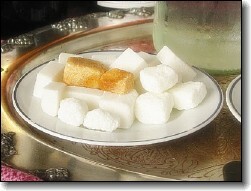 America, Africa, Arabia (hence the quantities of sugar that Arabs put in their mint tea). It is however a habit to unlearn if you truly want to enjoy the fabulous variety of aromas and flavours that tea has to offer. The absolute reference in terms of tea shop is without a doubt Mariage Frères in Paris. They’re one of the oldest establishments in France and have done a lot to give tea it’s “lettres de noblesse”. They have, as only the French can do, made tea a luxury product. Their assortment is huge (600 varieties). They have published beautiful books on the subject. They have a range of perfumed candles and exquisite teaware. They even have a tea musem above their historic adress in the Marais (which is really worth a visit). They’re very expensive but you have the feeling of buying something precious. The staff, in colonial outfits, are very knowledgeable and one discovers something new every time. 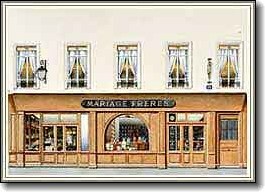 Mariage Frères is a bit the Hermès of tea : fabulous and very luxurious !!! If you’re in Paris and you like tea, you MUST visit. The adress is : 30 rue du Bourg-Tibourg, Paris 4e Tél. : +33(0)1 42 72 28 11. I would advise not going on weekends as the Marais shop is quite small and it quickly gets very crowded (which detracts a lot from the experience). Yixing (pronounced Yee-Shing) is a city in Jiangsu province in eastern China. It's very famous for it's reddish clay that has been used for centuries in teaware. It continues to be used today. The porous nature of the Yixing clay absorbs some of the tea aroma after each brew. Because of this, Yixing teapots are believed, over time, to enhance the flavor of the tea although to achieve this effect, one must always brew the same kind of tea in a specific teapot. This means that most people who use these teapots have several of them. For example, one for Ceylon, one for Darjeeling, one for Yunnan, one for Sencha etc... 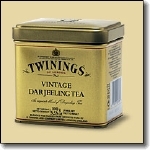 This tea enhancing property also explains their enduring popularity in China and now all over the world. Yixing teapots come in an incredible variety of shapes and forms. The two teapots pictured here are typical classic Yixing shapes but they can be much more elaborate or fanciful. They come in all price categories although they're generally cheaper than porcelain. Old Yixing teapots are collectors items and can sometimes fetch high prices at auction. Every good teashop sells them.